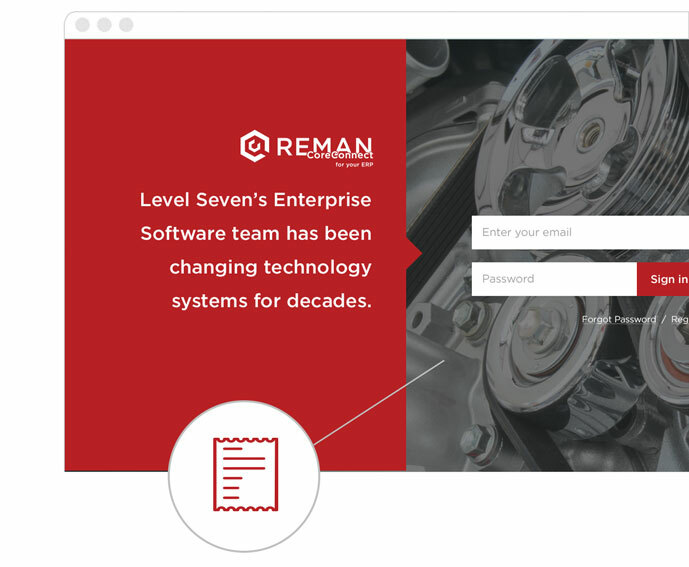 RemanCoreConnect™ utilizes a customer portal that provides insight into the core history and core eligibility of the customers of the remanufacturer. With this portal, customers are able to log into the system and view a list of all cores they have bought from the remanufacturer, the core due dates, and core history. On the remanufacturer side, the remanufacturer can also login and view all outstanding cores owed by all customers. RemanCoreConnect™ connects to any major ERP System in order to ensure safe and effective data handling, uploading, and reporting regarding all remanufacturing operations. RemanCoreConnect™’s custom branding allows for the system to be setup to match the custom colors and branding associated with the remanufacturer. RemanCoreConnect™ can be set up to allow users to set specific core terms per customer. As a result, based on previous receiving analytics, the core terms can be updated and individually set to ensure improved core returns. RemanCoreConnect™ tracks a core through the entirety of the remanufacturing teardown process. With RCC, users are able to track a core as it moves throughout teardown, enhancing the overall core tracking process. RemanCoreConnect™ is setup to track a core once received from a client. The system can be set to notify both the facility and customer once a core has been received and is ready for inspection and teardown. RemanCoreConnect™ gives the customers of the remanufacturer the ability to schedule a time and location for core pickups, thus improving the efficiency and efficacy of core returns. This solution allows organizations to inspect each returned core through an included inspection sheet. This inspection includes grade, a checklist of items, comments, and pictures, and is downloadable via a PDF. Over the past few decades, we found that most major ERP systems do not provide the functionality needed to address the two biggest pain points for remanufacturers, core tracking and teardown. RemanCoreConnect tracks a core from sale to return. At any moment, you can see what cores are outstanding by customer, by item number, or both. In addition, RCC has a smart forecasting tool that can predict return dates based on actual customer return behavior. If a customer returns a core that is not owed, the customer can put that core into their core bank. If the customer ever buys that core again, the customer will not be charged a core charge. Core banking is significant for customers who utilize hard to find cores.